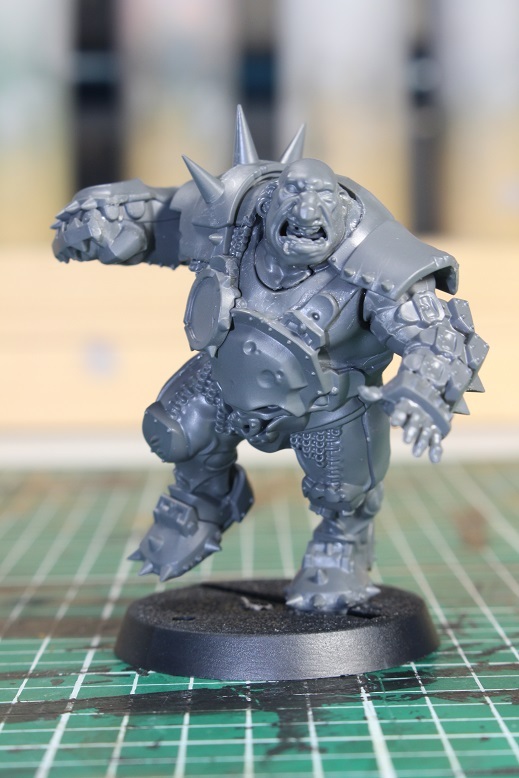 The New Blood Bowl Ogre Is Here! 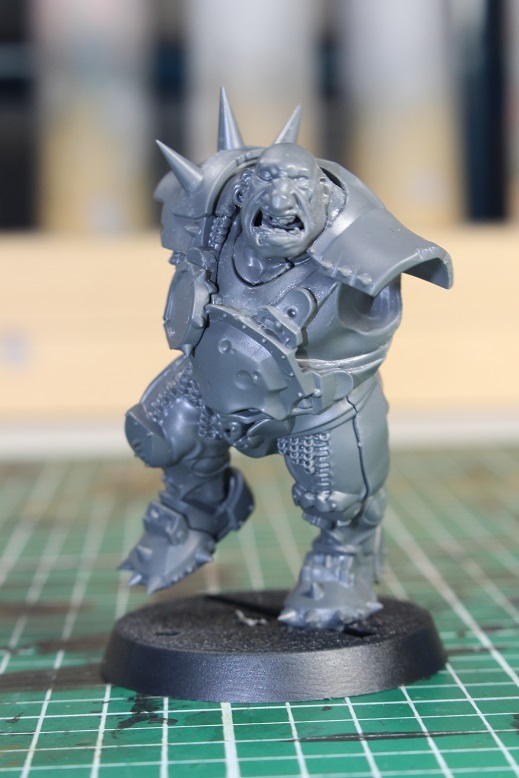 Well, the new Games Workshop rookie Blood Bowl Ogre came out today, so I went to my friendly local games store and picked one up. I spent a little time assembling the mini and now with the Korn, The Paradigm Shift album wailing away in the background, I will show you a closer look at the mini. 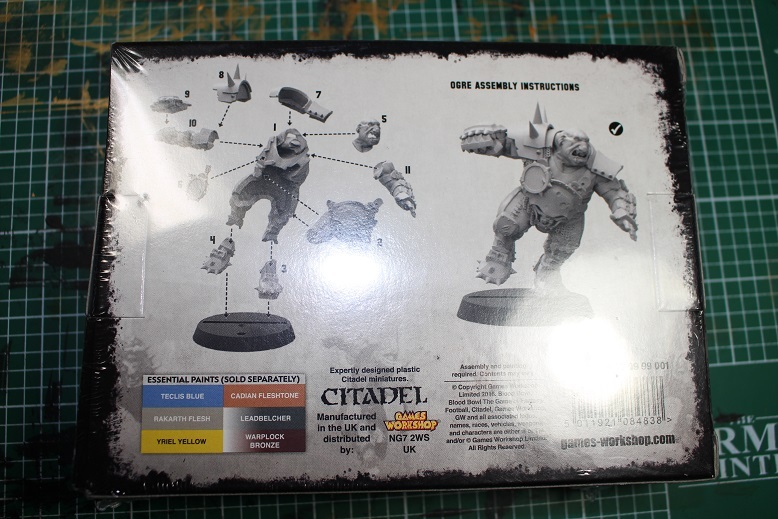 First off, I think it is worth noting that this box is the first single model release available from Games Workshop proper and not from Forge World web only sales. I am grateful for that as that means I could get the mini locally and not have to pay shipping fees. 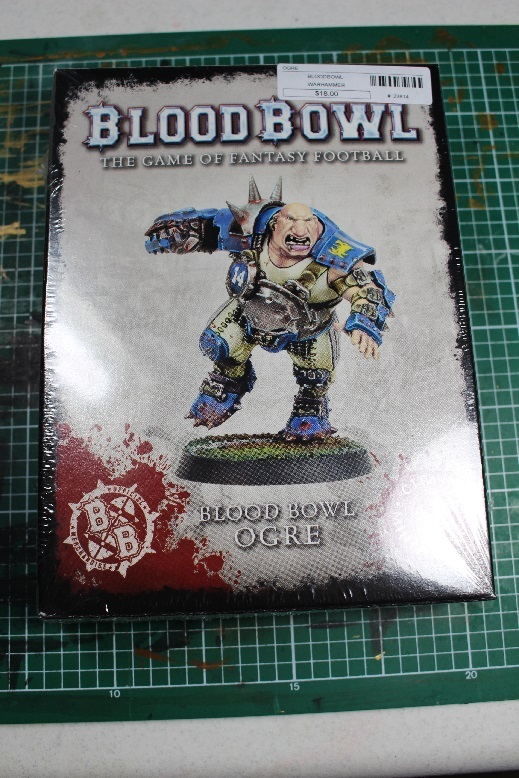 The front of the box has the standard Blood Bowl artwork and picture of a very nice paint job on the mini. A paint job that I have no hopes of coming close to, but such is life. Unlike previous releases, the back of the packing displays the assembly instructions instead of having a separate booklet inside of the packaging. I am OK with this change as I do not really feel strongly one way or the other on how I get my assembly instructions. 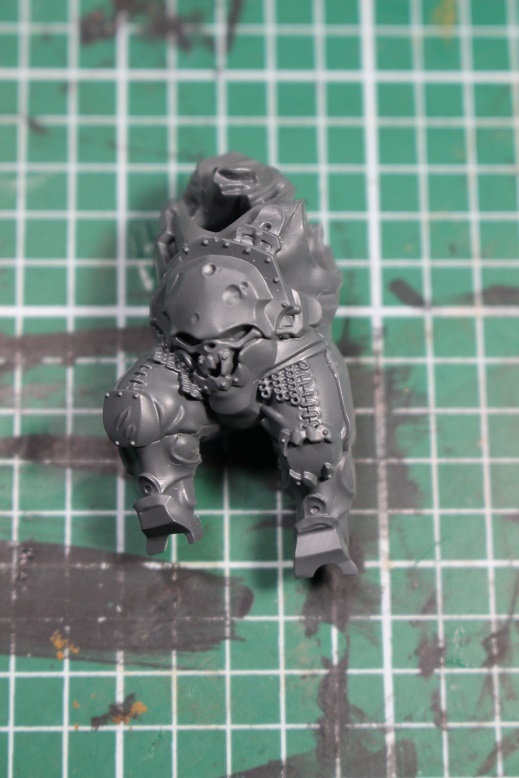 One thing I will say is much like the new Varag and Morg minis, this Ogre has more pieces than I really expected. Time to open the box! 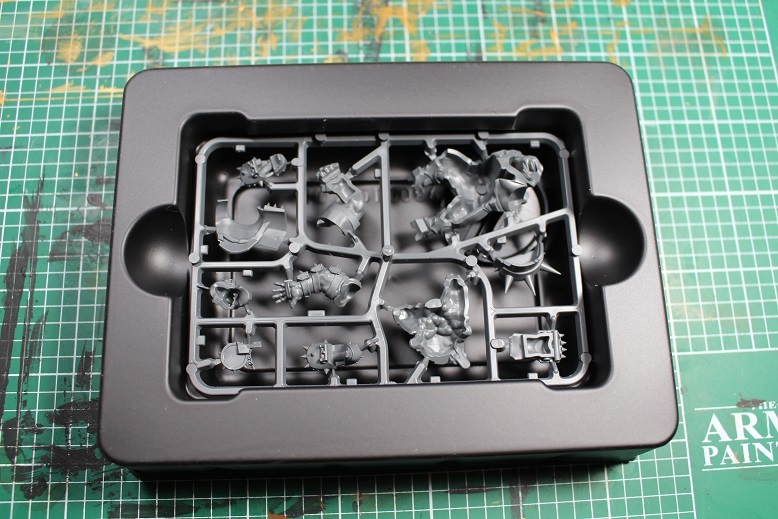 I have to admit that I was a little surprised when I opened the box to find the sprue securely held in place and protected by a thin plastic case. I do not think that any of the pieces on this sprue are fragile enough to warrant such protection, but I am certainly not going to complain. 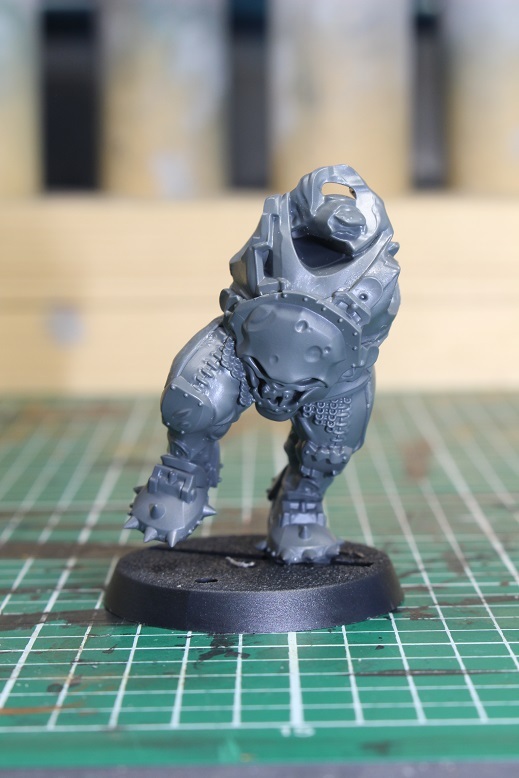 It would be nice to see this sort of protection on the Skaven minis as the tips of their tails tend to break off if you sneeze at them. Here is a slightly closer look at the contents of the box. 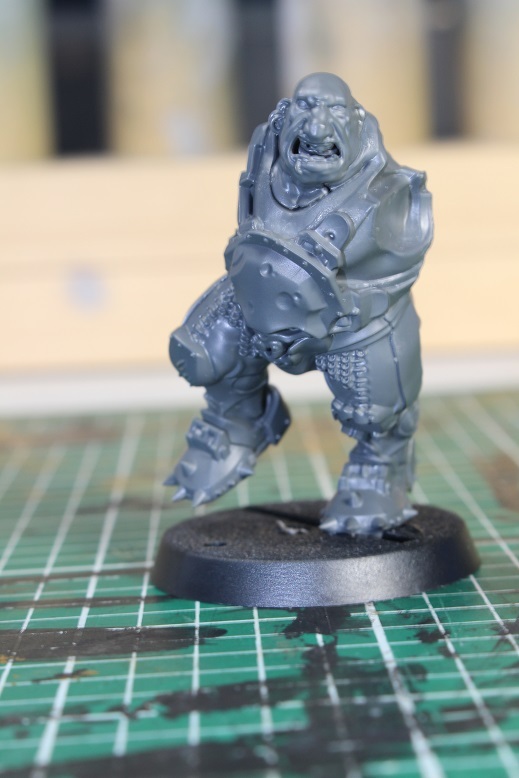 Unlike the Forge World Star Player releases, the Ogre only comes with one slotted base. 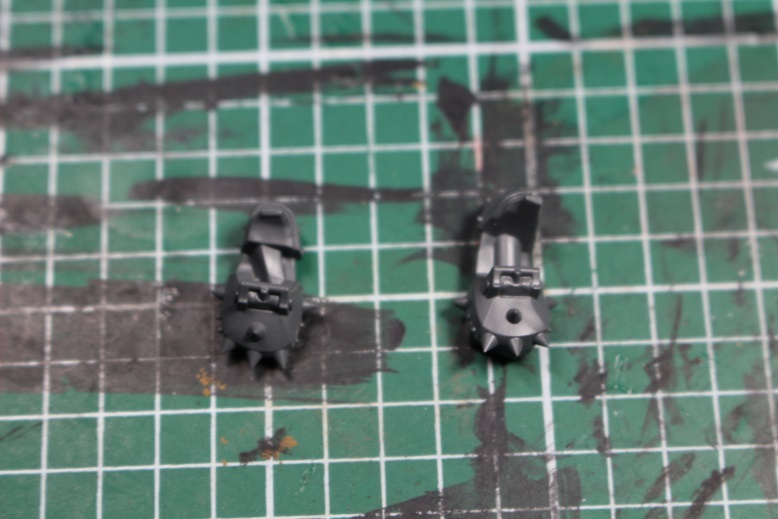 Initially I was going to use a spare 32mm standard that I have, but during assembly, I noticed that the foot that touches the base actually has a short base tab on it to hold it more securely in place. Once I realized that, I opted to keep the slotted base and will simply use some green stuff to fill the rest of the slot when I go to paint it. How about we start putting this bad boy together? Going in the order of the instructions on the back of the box, here is part 1. It is the back of the torso and legs. As you can clearly see, the inside of the mini is completely hollow. I am sure over time this saves Games Workshop a ton of plastic. Part 2 is the front of the torso and legs. Assembling the pieces is fairly easy and for the most part, the seams are cleverly hidden. The seam on this leg is along the front seam of the stripe that runs down the pants. Green stuff really only needs to be used on the belt/sash as the stripe down the leg is a narrow enough seam to be closed by painting. Same seam along the opposite leg. All in all, it is very well done. Next up is the feet! It kind of seems weird to have the feet be separate pieces, but I guess it allowed them to make the pose more dynamic. Whatever the reason, the feet were at least easy to put on the mini. Much like the legs, the seams on the feet were pretty cleverly hidden. You can kind of see the tab for the base on the bottom of the foot here. It is small, but it does its job well. Now that the feet are attached, we can put it on the base. 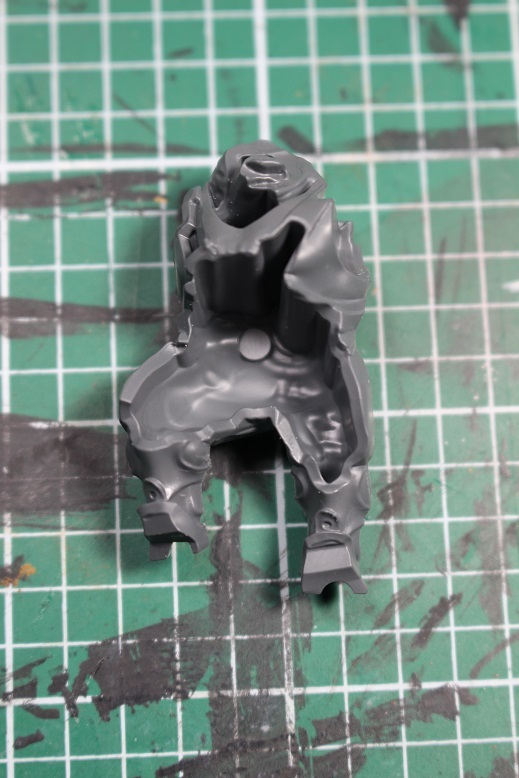 The small tab provides some much needed stability for a plastic mini that is only standing on one foot. So far, every piece has gone together very easily. Next up is the head. A little green stuff will take care of that gap on the neck. Otherwise the head went on very smoothly. It is easy to miss, but this pic shows the roster number plate on the Ogre’s chest. The shoulder pad here was the only piece that was not immediately obvious on its assembly. Maybe it is just me, but it took me 5 or 6 tries at dry fitting before it finally clicked and I was able to get it seated properly. Spikes! 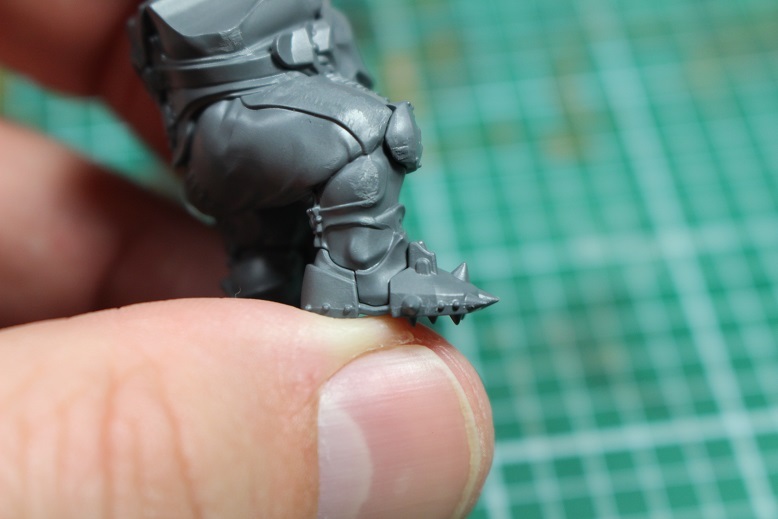 I have to admit, compared to the other minis that have come out so far, I am glad to see that there are only these three spikes on this one should pad on the mini. These three spikes feel natural and not over done at all. One arm attached! Finally seeing light at the end of the tunnel. The right arm is actually in two separate pieces, which I am not entirely sure why that was done, but it is what it is. The right arm is complete with only a slight gap to fill along the side of the hand. And just like that, we are done. For as many pieces as came on the sprue, this mini really went together pretty easily overall. I have to say that I really like this mini and I think that it will work with the new Human team really well. Now for the most important question that I always try to address… How big is it? I am glad you asked! Here is the Ogre next to the new Morg and a new Human lineman. Morg is slightly larger overall, though there are proportion differences between the two. Morg has a larger head and has a more “fit” muscular look while the rookie Ogre is slightly more pear shaped, with a larger waist line and slightly smaller chest line. Most importantly, the rookie Ogre has fewer spikes… Yea! 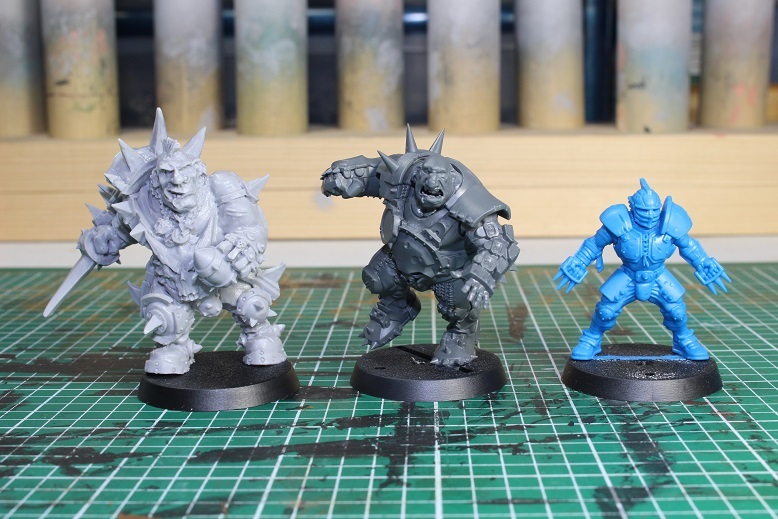 It definitely seems that the two Ogre minis were designed by different artists. Here is the new Ogre next to a 3rd edition Morg and a 5th edition Ogre. 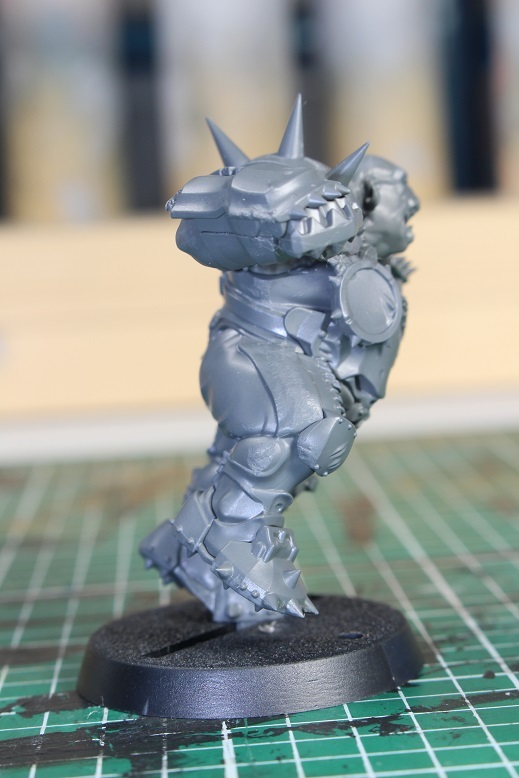 Surprisingly, if the 5th edition Ogre was standing up straight, it would be taller than the new Ogre. I did not really expect that. Not surprisingly, the new Ogre is a little bit bigger than the 3rd edition Morg, but not significantly bigger. 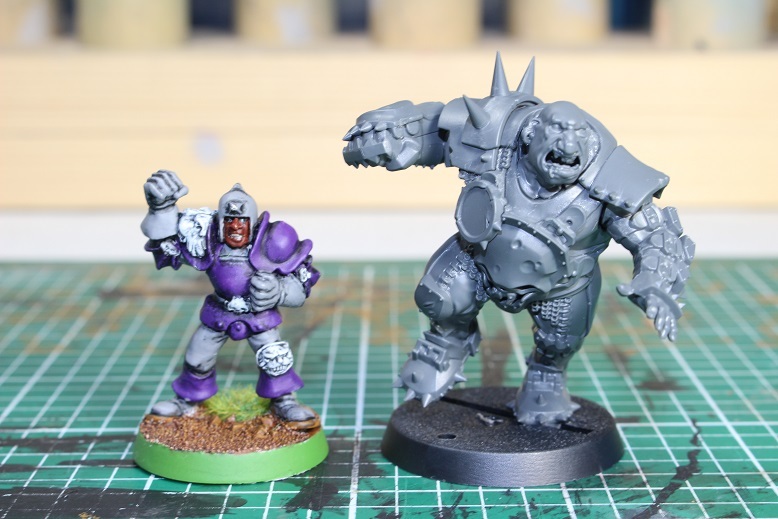 And finally the shot that everyone always seems to ask for, the new Ogre next to a 3rd edition lineman. That pretty much wraps things up for today. 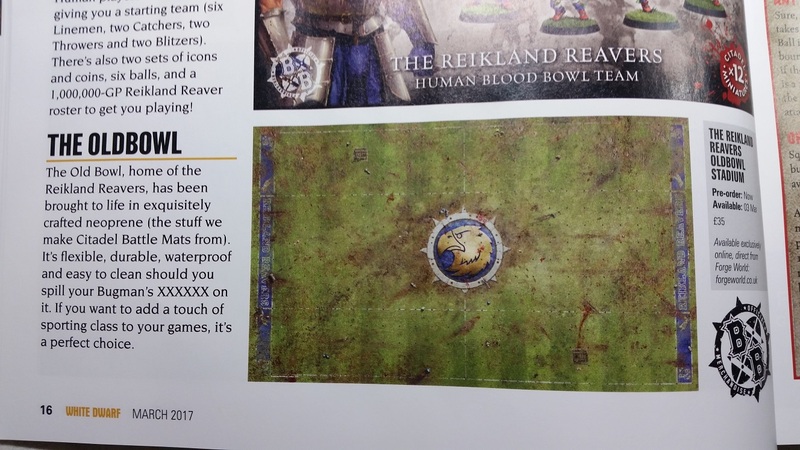 I also purchased a copy of the new White Dwarf today and it says that a new neoprene pitch called The Reikland Reavers Oldbowl Stadium was released yesterday March 3rd from Forge World, but I am looking at the Forge World site now and I do not see any listing for the pitch. If it shows up and I am able to order it, I will most likely pick it up and write a post on it, so keep an eye out for that. 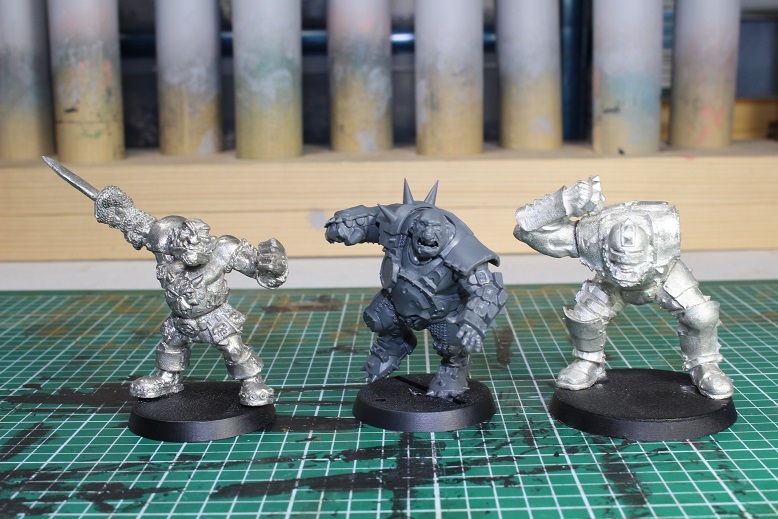 Otherwise, the next Blood Bowl release that has been heavily suggested is a Goblin team next month. If that turns out to be true, I will definitely pick that up and post about it. One final, not completely related note. 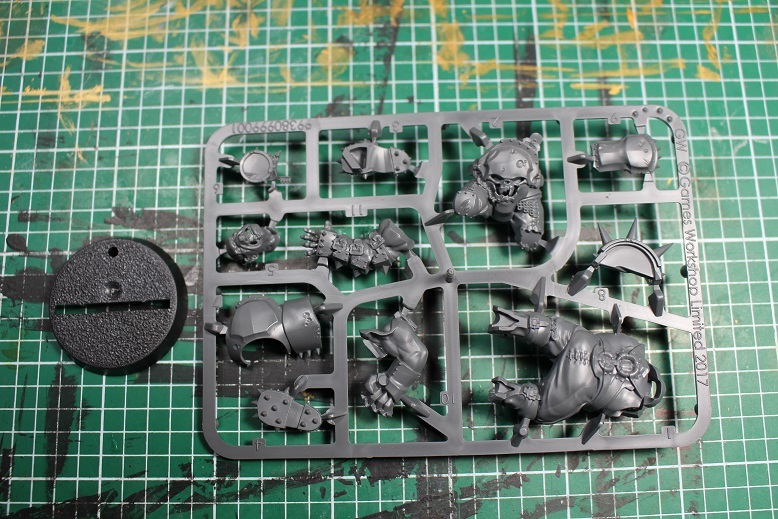 There are up sides and down sides to the way the new Games Workshop minis are designed and assembled. The big upside is that they can get more dynamic poses that they were previously able to manage. 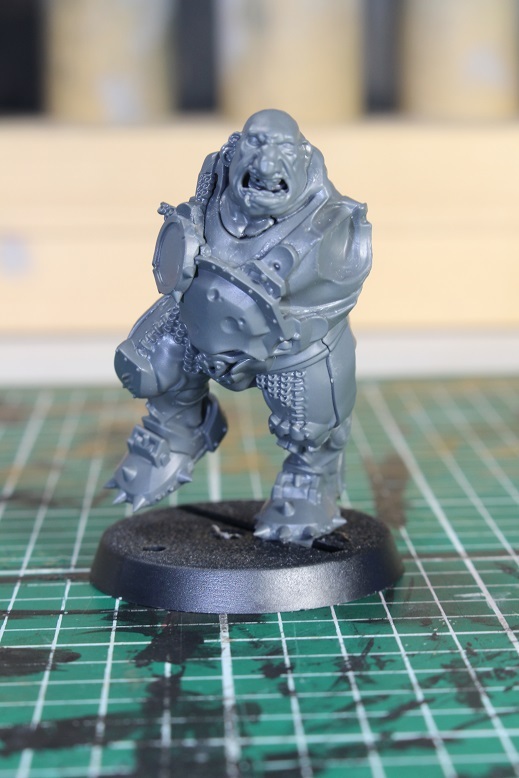 The big downside is that for people like me who are not really great and converting, these new style minis can make converting a little more challenging. 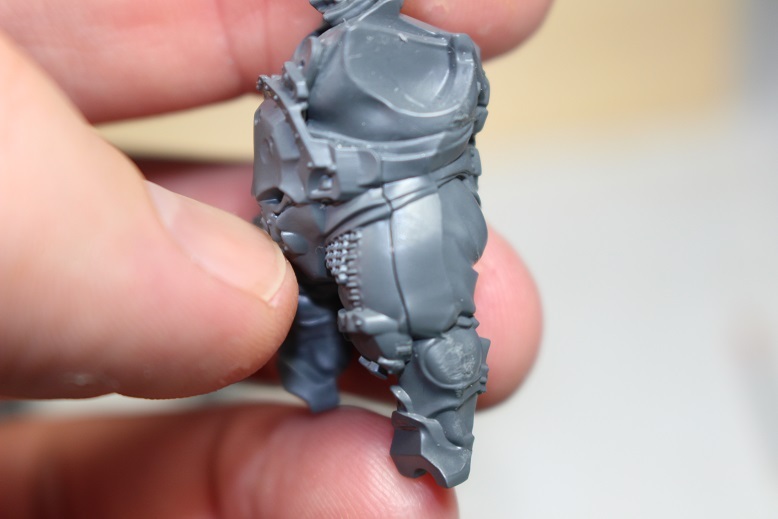 Since these minis no longer deal with a pair of legs, a torso, a couple of arms, and a head, but instead have all the pieces working together to create fewer join lines, you almost have to put the mini together, then cut it back apart to do significant conversions. I guess it does not really bother me as I am not much of a conversion guy anyway. 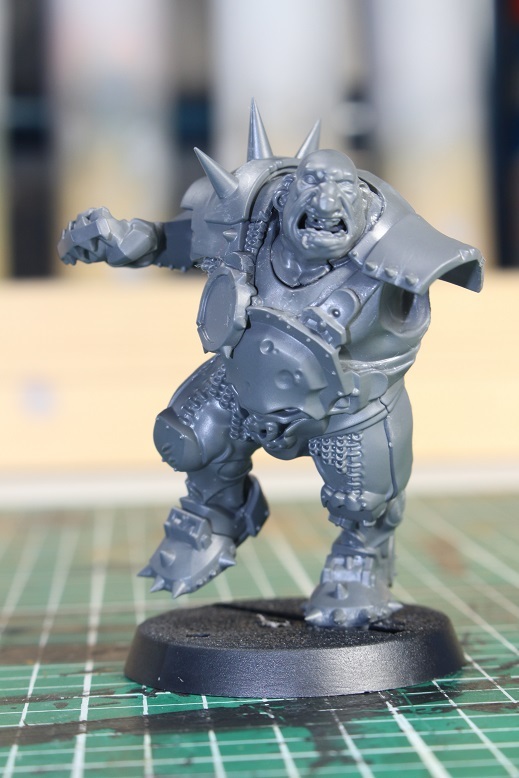 This entry was posted in Blood Bowl, Gaming and tagged Blood Bowl, Games Workshop, gaming, Miniatures, table-top games, tabletop wargames, wargames, Wargaming, White Dwarf by Mike C. Bookmark the permalink. 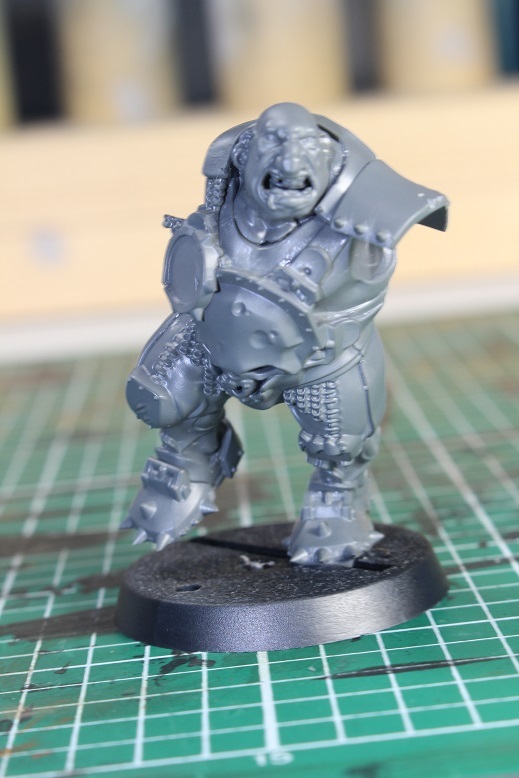 Great stuff, still waiting for my Morg to make it to Australia, but have been trying to find a good image to get the scale of the two ogres. Regarding the Neoprene Oldbowl mat: the article/release info was removed from the digital editions of the magazine, so I’m guessing something about the production changed last minute, but too late for print editions. good to know. maybe the quality wasn’t what they hoped or something. at 35 pounds, it was going to be a bit pricey, so i wouldn’t be heart broken if they decided not to release it at all. Got my ogre at the weekend, like you surprised at the tray. 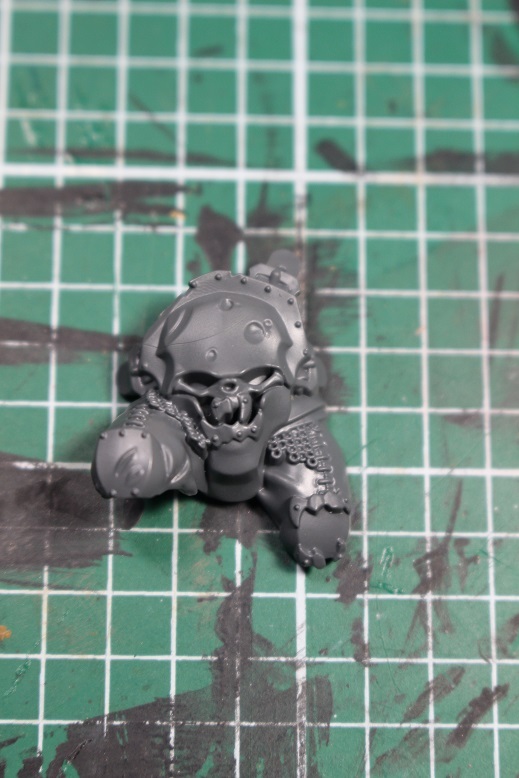 I’m thinking of getting a second one to convert into Morg as the forge world one don’t seem right to me. Hope to paint him up once I finish my dwarfs, the kazadin outhouses . I started painting my Ogre on Sunday. Hopefully it doesn’t take me too long to get him finished.